Our group comprises physicists, mechanical and electrical engineers, having an expertise in characterization of mechanical, physical, and chemical properties of surfaces on nano- and microscales. 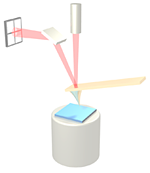 We are passionate in developing and building fancy atomic force microscopes. Furthermore, we like to discover the secrets of plants and animals like butterflies and geckos. We work in an interdisciplinary atmosphere focusing on the nano- and microfabrication of bio-inspired structures. If you are looking for a collaboration or a group to do your Ph.D., Master, or Bachelor thesis you are at the right place! Please contact us. February 2019: Christian's recent work on lambda-shaped carbon nanofibers is published in Small and got a nice cover page. December 2018: Christian successfully passed the final exam of his PhD thesis "Bio-inspired dry adhesives from carbon nanofibers and their potential use in space technology". Congratulations Dr. Lutz! November 2018: Radwanul H. Siddique, Yidenekechaw J. Donie, and Guillaume Gomard were awarded with the International Bionic Award 2018 for their work on the black butterffly Pachliopta aristolochiae. Congratulations for this big international honor. The original work is reported in an article in Science Advances and a KIT press release. June 2018: Claudia Zeiger finished her Ph.D. thesis "Biomimetics for Efficient Oil Water Separation: From Natural Oil Sorbents to Bioinspired Micro- and Nanostructured Polymeric Sorbents and Membranes" and passed the final exams very sucessfully. Congratulations Dr. Zeiger! June 2018: Our recent work on bio-inspired white films and oil-water separation is highlighted in two articles (structural colors & oil-spill cleanup) in Chemistry World. May 2018: Felix Vüllers completed his Ph.D. thesis "Bioinspired Superhydrophobic Nano- and Microstructured Surfaces for Drag Reduction and Optoelectronics" and finished the final exam with great success. Congratulations Dr. Vüllers! April 2018: Claudia's study on oil spill clean up with Salvinia leaves is highlighted in a podcast of Physics World. October 2017: Radwan's, Donie's, and Guillaume's work on the bio-inspired improvemet of solar cells got published in Science Advances and is featured in a KIT press release. September 2017: Senta Schauer successfully finished her Ph.D. thesis "Shape Memory Polymers for Bioninspired, Tunable Photonic Structure" and passed the final exam with honors. Congratulations Dr. Schauer! 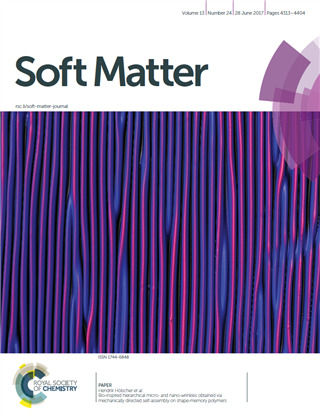 June 2017: Senta's paper on surface wrinkles produced with the help of shape memory polymers got a nice cover page. Please have a look. Mai 2017: We co-organized the 644. WE-Heraeus-Seminar on "Bio-inspired, Nano- and Microstructured Surfaces: New Functionality by Material and Structure" which was kindly sponosred by the WE-Heraeus Foundation. Please see the group photo. November 2016: Radwan's study on the blue tarantula is featured in a press release of KIT and an interview with Radwan on ResearchGate. August 2016: The study of Claudia exploring the oil clean-up with aquatic ferns is published in the journal Bioinspiration & Biomimetic. Please see the press release of KIT about this study. August 2016: Our work on tailored AFM tips is featured in Applied Physics Letters and the KIT published a press release about it. February 2016: Radwanul Hasan Siddique passed the final exam of his Ph.D. thesis "Structural Colors of Butterflies: Analysis and Fabrication of Bio-inspired Nanophotonic Surfaces" and finished with honors. Congratulations Dr. Siddique! October 2015: Radwanul H. Siddique's research is advertised as a success story on the web-page of the KSOP. July 2015: Our research on biomimetic nano- and microstructures is described in a podcast of "Welt der Physik" (in German). Please follow this link to listen to it. Juni 2015: Donie Yidenekachew won the best poster award at the IONS conference in Karlsruhe with his contribution "Bio-inspired Black Butterfly’s Wing Nanostructures for Absorption Enhancement in Solar Cells"
April 2015: The study on the glasswing butterfly (Greta oto) of Radwanul H. Siddique got published in Nature Communications and the KIT published a press release about it. July 2014: Radwanul H. Siddique's talk at the IONS15 conference won the best Oral Presentation award! June 2014: The Ph.D. thesis "Fabrication and Analysis of Bio-Inspired Smart Surfaces" of Dr. Michael Röhrig was awarded with the "Dr.-Ing. Willy-Höfler-Doktorandenpreis" for the best dissertation in 2013 in the Mechanical Engineering Department of the KIT! Congratulations, Michael! And all the best for your future work. Mai 2014: Tobias Meier successfully finished his Ph.D. study "Magnetoresistive and Thermoresistive Scanning Probe Microscopy With Applications in Micro- and Nanotechnology" and passed the final exam with great success. Congratulations Dr. Meier! Mai 2014: Claudia Zeiger received a scholarship from the ZEISS Foundation supporting here Ph.D. study "Oil/Water separation utilizing biomimetic nanofur from biodegradable polymers for the cleaning of oil spills". Congratulations for this great success!